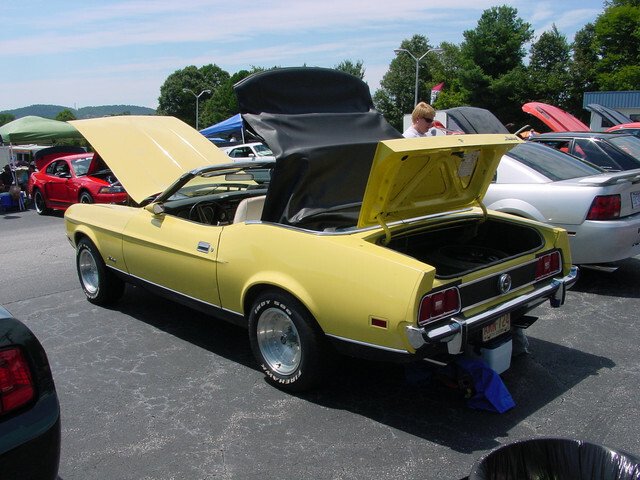 I have been in the classic car world for a while. First car was a 59 Edsel which I replaced with a 57 Olds 98. I am currently working on a 52 GMC 1 ton pick up as a hobby build. 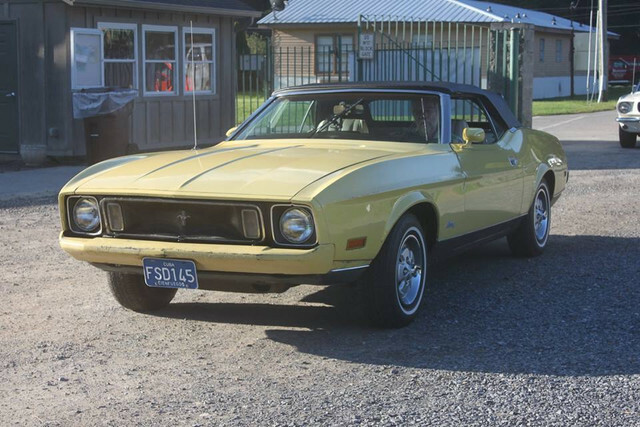 I am currently looking to trade in my 57 Olds and 2008 Harley on a 1973 Mustang convertible, 302 V8, bronze metallic paint. It has 33000 documented miles. I am currently negotiating price and have also requested a few things dealt with. Once they are finished with the work will determine wether this happens. I am joining today to due some research through the forums. I am pretty sure that we will be closing the deal. Hello and Welcome from Michigan. Are you sure about the 33,000 original miles? There’s been quite a few things changed for being such a low mileage car. But nothing that can’t be changed back either. Not sure what you were told about the car so hopefully you have done your homework before buying it. If you need to ask some questions about it, you’ll get plenty of answers here. Good luck with your new ride. As noted, the car has some changes from factory. I am in Niagara, where r u located? That car has had an awful lot of work and changes done to it for 33k miles. I see way too many things that have been refurbished for a car with such supposedly low mileage. Do you have a link to the dealer's website so we can see the actual listing? Repainted and not that well. Engine has been out, or detailed and poorly done. Engine compartment is far too shiny with incorrect finishes to be anything original. I smell a fluff and buff - tread carefully. Like others said...BE CAREFUL and do your homework! Other than that, welcome from Omaha! Hello and a warm welcome from another SW Ontario member. Yes it looks very nice, BUT too many changes and some that would make me ask "Why", like the braces up front. Totally unnecessary on a stock car. 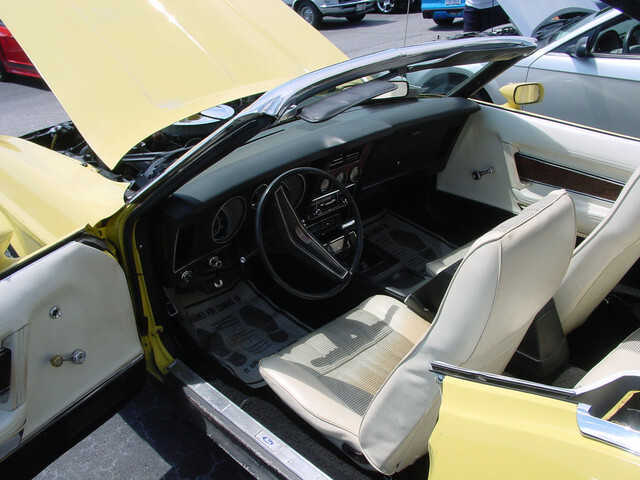 I would want to start looking from the underside, look for replaced floor panels etc. As many others have said, be careful something "smells funny". Good luck though, it could be a gem under the changes. One thing for sure car dealers do not have to tell the truth part of their sacred code, lol. Sever have stated some of the facts. I have 5 verts two 73. 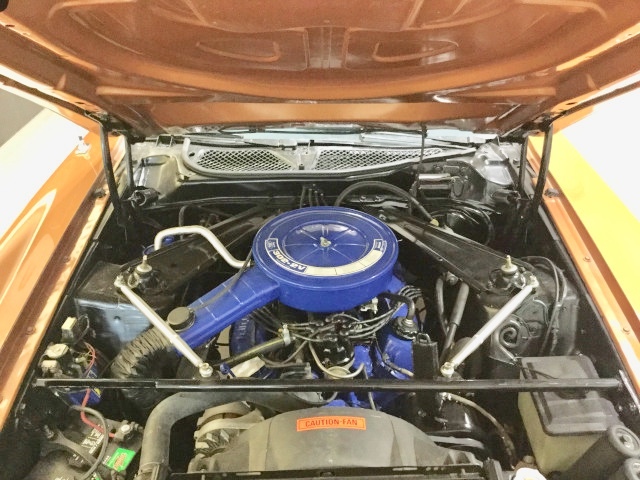 One is 48,000 mile California car with original paint and interior. For sure the hood is wrong. 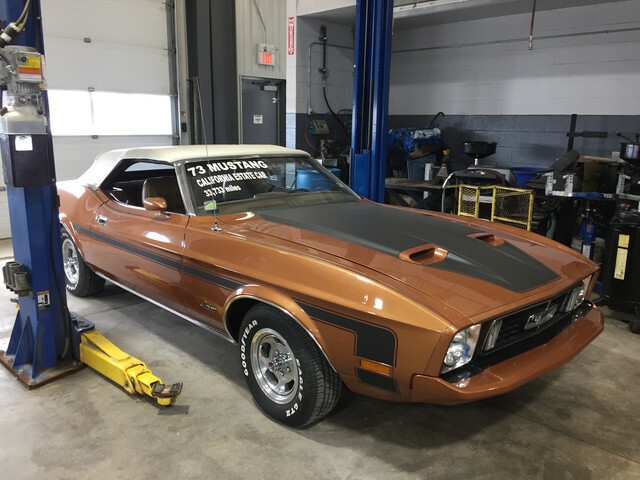 I do not think you could even get on a 302 unless Mach 1. Would need to check the Ford Facts Book. You could not get the black out on the hood and not have hood locks either. They came together for $18.00 in 73. the scoop inlets would also be black not body color. The shape and size of the black is way off. 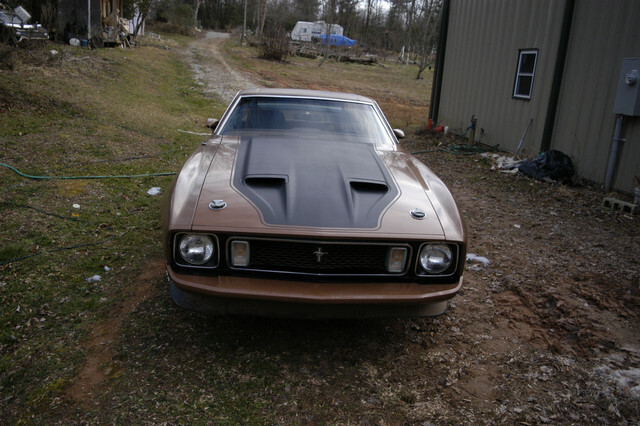 The pic of the 73 Mach 1 is my original one owner never painted. To get the side stripe you had to get Decor Group which blacked out the lower side of the car. This car has rocker moldings so not a Decor Group. You also got Mach 1 grill with DG. 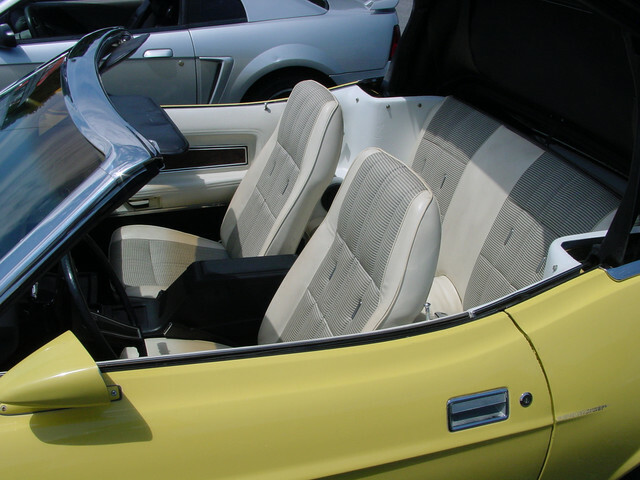 The Forged aluminum wheels were optional on any model in 73 only. All 71 - 73 verts had glass rear window cannot tell about this one. All were power top also. The interior should be CW Comfort Weave cannot tell. You should get a Marti report for $18.00 will tell you what was on the car originally. Lots of tinkering under the hood. Look under car to see if someone has but sub frame connectors in. With all the added bracing under the hood area I suspect someone might have autocross the car. I do not know what the two canisters in front of the windshield washer tank are. Maybe oil start up pressure tank. Looks like the hood hinges have been painted. Under the hood the following should not be painted but have iron phosphate coating. Looks frosted and gray. It is same as parkerizing on a gun. Hood hinges, hood latch, AC brackets, upper shock mounting caps. Also under the hood certain things should be Slop Gray. Ford mixed all left over and recovered paint into one tank and painted parts with it. It varies since not a standard color. The following should be slop gray. Center grill support. Bracket the hood latch bolts to, part of grill support, the two small braces on the bottom of the front fender, front tag frame, flat tray under the headlight bucket, angle brackets that attach headlight bucket to radiator support. The trunk should be gray spatter paint. Verts, FB and regular coupes did not get a trunk mat only Grandé model. You need to look at the cowl even California cars rust due to simply washing them with running water. They rust on each end most frequently. All of them have rust around the tail lights check inside for repairs showing. If floors have any patches then the mileage is very wrong. Depending on how you want the car, original or to your taste is entirely up to you. It would take considerable time and money to bring this back to original. One other check you can do is look for the VIN# stamped into the block on the drivers side just below the head in the rear. Will be partial number that should match the number on the dash. The number is also stamped in the transmission. If not numbers matching collectors shy away from them. So here are some pics. 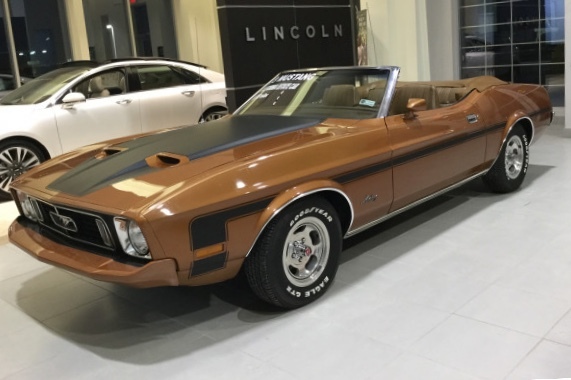 The Mach 1 is going to museum next week for display during 55 ann. celebration in Charlotte NC. I took these wheels off and went back to Sport Wheel covers like on the Marti report. This is a Decor Group car. I has 48,000 miles California car no floor rust, 351 H code, automatic, AC, PS, PDB, long console, gauges, tilt column, convenience group, sport mirrors, rub stip in rear bumper, decor group. I purchased off ebay couple years ago for $7,200 and $1,000 to ship across country. PO had built the engine with .050" over bore, cam, valve job, 2-V to 4-V, MSD, Holley & shift kit. Original chipped up paint but only original once. Came with new top in box and original wheels and caps. Do your homework they will sell you anything and smile all the way to the bank. Estate cars usually sell at auction for cash only and go cheap from ones that I have attended. I have an estate auction 1950 Ford two door sedan that sold for $1,000 with 16,000 original miles on it. Last estate auction I went to this past summer had over 35 vehicles and all sold very cheap. Not many people can just throw down the cash. BTW the 302 is sort of at the bottom of desirable. Nothing wrong with it but 351 have more power and more desirable. I had one last look. It looks like the fender bolt heads are painted. 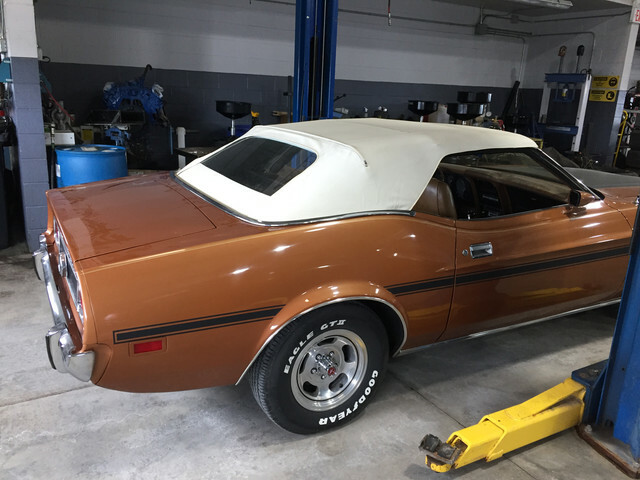 If so a complete repaint of this car might not even be original color, Marti or door sticker would tell. The cars were painted with hood and front fenders off. Trunk & doors were installed. (04-07-2019, 08:55 AM)Carolina_Mountain_Mustangs Wrote: Welcome to the forum. You have a 351? A 302? A 6 Banger or a 429? Great, it shouldn't matter. What only should matter is that the drive train is original to the car!!! BTW the 302 is sort of at the bottom of desirable?? EXCUSE ME!!! For comparison the 1971 302 Windsor 210 hp @ 4600rpm with 9.0:1 compression versus 1973 351/2V 164 hp @ 4000rpm with 8.6:1 compression. More Power HUH? I think we all are on here for the sake and love for our cars, regardless the engine size/hp/torque/body style or year!! !